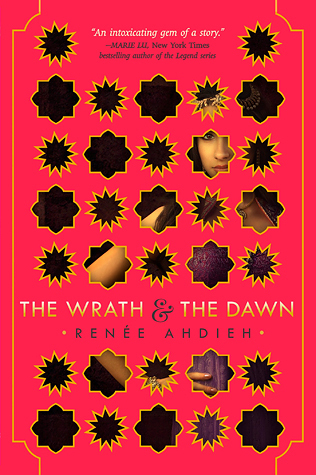 I was very excited to read Renee Ahdieh's The Wrath and the Dawn, pretty much entirely because I love anything based on the Arabian Nights. Ahdieh's book got rave reviews on GoodReads, which was another good sign. But really, it was all about the 1,001 Nights and those interlaced stories. Which is why I was pretty disappointed when I realized that this book did not in any way center on the stories that Shahrzad tells her husband each night in an effort to extend her life. From what I recall, we hear two stories that Shahrzad tells the caliph, which is significantly less than 1,001, I think you'll agree. It is probably unfair of me to hold this against the book, but I definitely do. I just really wanted all those layered stories, and I got zero layered stories. Mostly, this book is about the dramatic love story between Shahrzad and her husband, Khalid, the caliph. And all the heartache the two must endure. In mostly agonizing silence. But there wasn't a lot of laughing in this book. It's a lot of drama and tension around Shahrzad's Stockholm Syndrome of falling for her husband (after approximately 36 hours of marriage, from what I could tell). She is filled with angst for loving someone who has killed so many women already, including her best friend. At least, that's what we're told. But as Shahrzad spends hardly any time in the book thinking about her friends or family that she left behind when she got married, it's hard for readers to feel much empathy for her situation. Once Shahrzad got married and moved to the palace, it was as though she lost interest completely in the people she left behind. I wanted to know the people she left behind so that I could understand her guilt (which didn't last long). It's not that Shahrzad is a weak character. She's not. She's fierce and stubborn and beautiful, and I can see why so many teenagers would fall completely in love with her. But she didn't really develop as a character, we were just supposed to like her because she was independent and good at everything and didn't feel bound by the rules that usually governed women. All of that just got tiring for me. Shahrzad just blew either fully hot or fully cold. Promptly after falling in love with her husband, Shahrzad switches from guilt about betraying her friends to anger with her husband for not divulging all his secrets to her. There are other characters in this book. Khalid, Shahrzad's husband, is also tortured and dramatic and beautiful. His cousin and Shahrzad's handmaiden. Shahrzad's first love, Tarak, with his piercing eyes. (Shahrzad, in contrast, has "tiger eyes.") Bedouins and magicians and armed guards. I think they all could be pretty interesting people except that there is so much angst around Shahrzad and Khalid that they are not given the opportunity to develop very much. And everyone and every moment is described in such flowery language. It's hard to imagine 16-year-olds and 18-year-olds speaking in such a manner. It was just a lot, and in many ways, a bit too much for me. The Wrath and the Dawn is the first book in a duology. I am not entirely sure if I will read the next book. Though the story had some solid points and there is a fairly intriguing curse/mystery/magic situation brewing, I don't know if these characters are for me. Too much hot and cold, too much too quickly, and not really enough focus on developing deeper characters and deeper emotions. Wait, what?! When did that happen? Bummer. I guess I will stay away from this one. However, I have been looking for a really good translation of the original Arabian Nights book and have not been able to settle down on one. Richard Burton's translation seems to be the popular one but I don't know if it has all the 1001 stories. Have you read any of the Arabian Nights books? I have read a couple of versions, but I don't think I've read them recently enough that I worried about the translator. I would love to find one that has all the stories, too! Or at least a significant portion of them. If you enjoy retellings, I really liked Cathrynne Valente's In the Night Garden, though I have not read its sequel. That is too bad you didn't like this more! ha ha - I love your blog post's title. This has all the marks of a book I would abandon. I actually don't know if the title is that apt! It isn't really a boring book, it just seemed to repeat things that I didn't think warranted repeating (OMG THE GUILT) and didn't touch at all on things I thought were more important (why the guilt was warranted). The fatal ear tuck!! (It's not fatal, but ever since Jill started talking about it, it does make me snort when I encounter it in books.) Yeah, at this point I'm leaning away from reading The Wrath and the Dawn. I've heard enough negative stuff about it to make me feel like it's not the book for me. Oh, I'm actually glad to hear that! Well, not GLAD exactly. But most people do really love this book, it just wasn't for me. I'm glad that other people thought it wasn't for them, either.